I was looking around the SFMTA/Muni website and reviewed the agenda documents for the SFMTA Board of Directors meeting that will be happening this Tuesday, December 4th. The SFMTA Board of Directors are going to vote on a proposal for free Muni rides on Friday, December 28th, 2012. 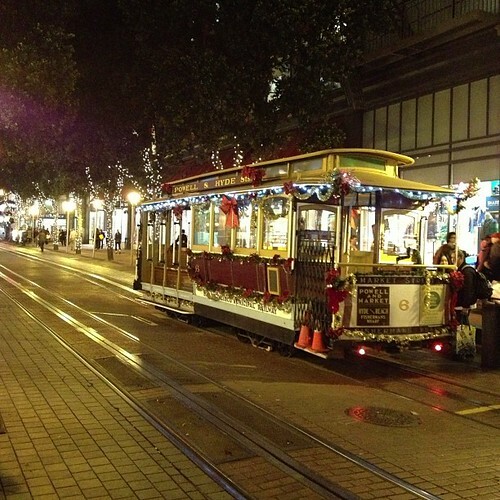 You heard that right, free rides on all Muni lines, including the $5 $6 per ride Cable Cars. Why the free rides? It's Muni's birthday, but not just any usual birthday, it's their 100th. Back in 1912, the city's Muni service was born and after 100 years, now provides over 200 million passenger trips a year. The SFMTA considered an alternative to have the fare at five cents, but are not recommending as it is more difficult to execute. If all goes well, the SFMTA Board will approve this and you'll be able to enjoy going around the city fare free! I personally think this is a great idea to give free rides for a day to celebrate the agency's 100th anniversary. It's great for those who are enjoying their time-off, but also gives thanks to those still needing to take public transit to work on the last Friday of the year. While it may be free, if the city has learned a lesson from the Spare the Air free transit rides, it could possibly slow down bus lines as more people would just take a bus and just get off at the next stop simply because it's free. Others complained it turns into a moving homeless shelter. But since it's very late into the year, Muni's passenger loads should be lower. Five cents or not? I believe charging five cents has its logistics and cost issues, including the need to print thousands of paper transfers and making sure the Clipper card equipment is modified for that one day. At least when it's free, you won't have fare inspectors writing $100 citations for failure to pay a nickel fare. The cable car lines are actually $6 each these days. Thanks Bruce. I've updated the blog entry. Clipper Card Readers Beeping Too Loud?